One of the things that most interested me as I wrote this book, was that the fur trade in the territory we now know as British Columbia had such a short life. New Caledonia’s fur trade began with the North West Company’s explorer Alexander Mackenzie, and his attempt to reach the Pacific Ocean. Alexander Caulfield Anderson’s fur trade experience began less than 40 years after Mackenzie’s failed expedition. 1793: In his search for a route to the Pacific Ocean, Alexander Mackenzie followed the Fraser River south to the area where Fort Alexandria was later built (south of Quesnel, B.C.). There the Natives advised him to follow the West Road River to the Pacific, and he successfully reached the ocean at modern-day Bella Coola. However, Mackenzie found the route so difficult he discouraged the North West Company from entering the new territory. 1805: Seven years after Mackenzie’s exploration, Simon Fraser and John Stuart, also of the North West Company, arrived at McLeod’s Lake to build their Trout Lake Post. In 1806 they founded Stuart’s Lake Post (later Fort St. James), and in 1808 they followed the Fraser River to its mouth. The explorers faced many dangers and returned home to Fort St. James, making no further attempt to find a route to the Pacific Ocean. 1821: Unknown to the NWC men who were building Fort Alexandria, the North West Company and Hudson’s Bay Company merged under the name of the latter company, and George Simpson became the Governor of the new Hudson’s Bay Company. 1824: The NWCo’s old Fort George, at the mouth of the Columbia River, was replaced by a new headquarters 100 miles inland, and named Fort Vancouver. 1826: The first New Caledonia brigades brought their furs southward to Fort Vancouver, and this new brigade trail over the Thompson Plateau and through the Okanagan Valley would be used every year until 1847; it was only 21 years old when it was abandoned for the new Anderson River trail to Fort Langley. 1827: Fort Langley was built on the lower Fraser River. From Thompson’s River, Francis Ermatinger explored a new route through the Lillywit (Lillooet River), looking for a route to Fort Langley. Anderson would follow the same route in 1846. 1828: Twenty years after Fraser and Stuart descended the River, the HBC’s Governor Simpson and a few of his Chief Traders frightened themselves silly in a descent of the Fraser. Simpson declared that bringing the brigades out by boat would result in certain death nine times out of ten. 1835: Alexander Caulfield Anderson entered New Caledonia for the first time, taking charge of the 21-year old Fraser’s Lake post. 1840: Anderson and his wife, Betsy, rode over the old brigade trail to Fort Vancouver, and took charge of Fort Nisqually (on Puget Sound) for a few years. Winter 1842: Alexander Caulfield Anderson returned to New Caledonia to take charge of Fort Alexandria, and was probably the first Gentleman to ride over the new brigade trail between Kamloops and Fort Alexandria. The next spring he would bring the brigade out by that new trail, and the old trail over the Thompson Plateau to modern-day Little Fort disappeared. 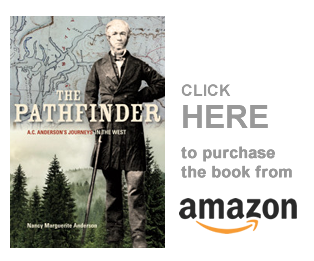 1846: 19 years after Francis Ermatinger explored the Lillywit river, Anderson followed his path down the same river and reached Fort Langley. His return journey to Kamloops took him over the Coquihalla Mountain range east of what later became Fort Hope (Hope, B.C.). On the north side of the mountain the fur traders met the Similkameen, Blackeye, who told them of an easier trail over the mountain. 1847: 39 years after Simon Fraser explored the Fraser River, Alexander Anderson made two expeditions down and up the Fraser River, discovering what he thought might be a suitable horse road between the two posts. 1848: The massacre of the Waillatpu missionaries and resulting Indian wars forced the New Caledonia fur traders to bring out their furs by Anderson’s unfinished trail, by what they began to call Anderson’s River. No one kept a journal of the outgoing brigade, but Anderson said it was “harrassing.” The return journey was chaotic, and on their arrival at Kamloops, the Gentlemen all agreed that a new trail must be developed by Blackeye’s Trail, to the new Fort Hope. 1849: The outgoing brigades came out once more by the Anderson River trail of 1848, but returned by a surprisingly easy trail over the Coquihalla. It wasn’t perfect, and the fur traders spent many years trying to find a way around Manson’s Mountain — but it worked. This was the brigade trail the fur traders used up to 1860. 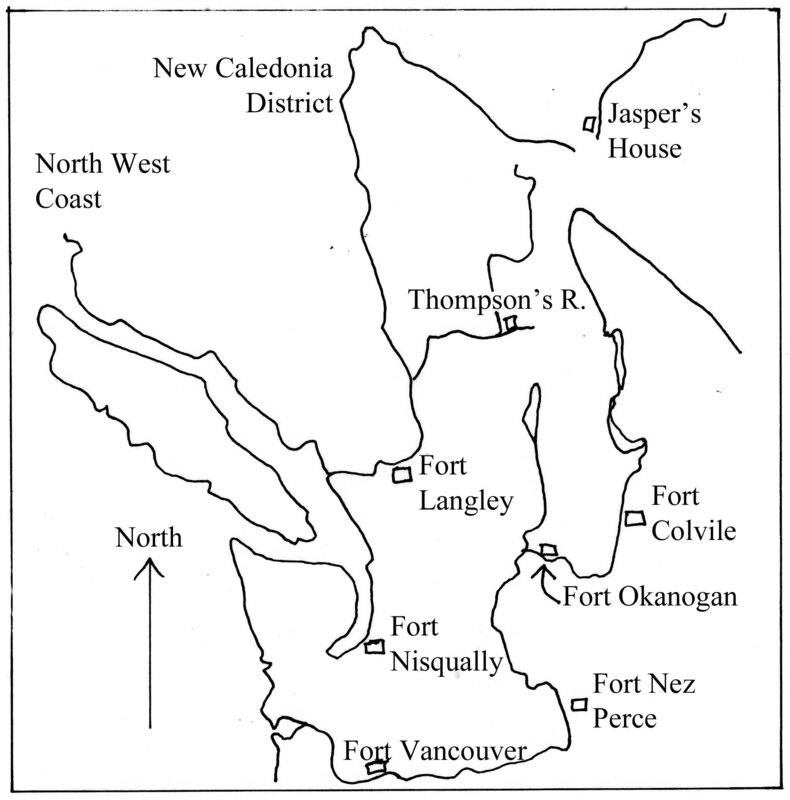 1858: The American gold miners swarmed their way north via the old Okanagan brigade trails and by ship to Fort Victoria, on their way to the goldfields on the Fraser River. Anderson’s first exploration via the Lillywit (Lillooet) River became the first highway into the interior and brought thousands of gold miners north of the rapids and canyons that had confounded the fur traders for so many years. 1860: The Royal Engineers carved roads out of the cliff-faces between Yale and Boston Bar, above the rapids and falls that had so troubled the fur traders. By autumn 1862 their road reached Lytton, and in 1863 the first Alexandra Bridge crossed the Fraser north of Spuzzum, its eastern end resting where Anderson had buried one of his voyageurs in 1848. The Royal Engineers roads opened British Columbia to settlers, and though the fur trade continued for many years after, the brigade trails were more or less abandoned. There we have the short chronology of the fur trade in British Columbia; though we feel as though the fur trade was here forever, it was not. Thank you for your interest, and I enjoyed your post too. We have common interests I think.